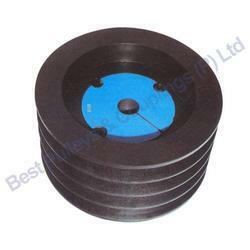 Best Pulleys & Couplings (P) Ltd.
- Dual Duty grooves to perfectly match Classical V and Spacesaver Wedge belts. - Standard range caters to drives up to 200 Kw with speed ratios upto 1:7. - Shelf to shaft 'Taper Lock' bushes. Manufacturers of Positive drive pulley (Timing pulley) manufactured from quality materials, like Ferrous and Non-ferrous (Steel and Aluminum Alloys Material as BSW-4548-1970; DIN 7721) OR as per different Standards OR as per customer's drawing. Our company is involved in the supplying of Pulleys (Metric Pulleys), procured from the renowned and reliable vendors. Our range of Pulleys (Metric Pulleys) tested under various parameters, which ensures the durability and reliability of the product. We offer this range at competitive prices to our valued customer. We offer HTD Timing Pullies in different sizes 3m, 5m, 8m, 14m, 20m. We have gained expertise in offering a quality assured assortment of Taper Timing Pulley. The Taper Timing Pulley we offer is widely demanded amongst the clients for its safe use. Offered products are available in the market at industry leading prices. Leveraging over the skills of our qualified team of professionals, we are instrumental in offering wide range of Timing Belt Pulley. We are trader and supplier of a wide range of Timing Belts. These Timing Belts are highly appreciated for their capacity to bear high oil & heat pressures. These Timing Belts are offered in diverse thickness, lengths and other related specifications. Clients can avail these products from us at market leading prices. We design and offer wide array of timing pulley. These are manufactured in different models and sizes to address the demands of diverse industries. We make use of high quality raw materials in making these pulleys so as to provide optimal durability standards. Banking on the skills of our qualified team of professionals, we are instrumental in offering supreme quality range of Timing Belt Pulley. We are one of the leading distributor of superior quality Timing Belts and Pulleys. These Timing Belts and Pulleys are good demand in the market due to high quality and durability. These products are available in market at competitive rates. We provide wide variety of the timing pulleys which gives superlative performance and of very high quality. These timing pulleys can also be customized according to the requisite customer specifications and details. In order to keep the ever growing demand of our clients, our company is involved in offering a wide range of Timing Pulley. This product is widely accepted in different regions and appreciated for its rugged structure and quality performance. Furthermore, our clients can avail this product in bulk.